Gun Control Hearing In Republican Committee? Gun owners thought they had won a decisive victory by defeating House Bill 3999, the so called “bump stock” bill, but the fight appears to be far from over! Behind the scenes, Republicans have been quietly gearing up to look at passing gun control. We need you to act right away and demand that any and all forms of gun control be opposed. Fighting gun control isn’t a new battle that gun owners are just waking up to. Gun owners have banded together to defeat many gun control bills that have been introduced over the last 10 years. And that’s just at the Congressional level. Gun owners have been successful at stopping the same types of gun control at the state level as well. We have also been successful in crushing the spirits of the gun grabbers by passing Constitutional Carry in nearly 10 states in the last 5 years. Idaho was one of those states! Despite all those victories, gun owners this year are still fighting gun grabbers, but now the battle to defeat gun control also includes Republicans! You see, after gun owners defeated Senate Bill 3999, the squishy Republicans drafted another version with different wording. Their intention is to “fix” the problem the ATF left them when they declared bump stocks to be a legal device. “Bump stocks” will only be the beginning for the gun grabbers. Their hope is to get their foot in the door to ban semi-automatic weapons, accessories, and other firearms. Even if the current wording of the bill doesn’t include such items, the gun grabbers intend to use the “amendment” process to shove Bloomberg’s agenda down our throats. And as the “bump stock” debate continues, we now have an additional mass shooting that has just taken place in Sutherland, Texas. That’s where a killer walked into a church where people were worshipping God. He killed at least 26 people and injured dozens more. In addition to their gun control cries, they mocked and scorned gun owners and people who prayed for the victims. What they aren’t talking about is the hero (Stephen Willeford) who likely saved many more lives when he shot and wounded the Texas killer with his AR-15! The very rifle that the media and gun grabbers want to ban is what ultimately stopped the killer in Texas. Banning standard rifles like the AR-15 is exactly the type of “amendment” the gun grabbers will try to slip into the newest version of the “bump stock” bill. And now gun owners must defend the Constitution in the wake of the Texas tragedy as we have done time and time again. You see, they don’t really care about you. They don’t care about your rights, or your life. They want CONTROL over it. Gun grabbers don’t want you to carry a gun around to defend your loved ones. They believe the police should be the only ones to have firearms, despite the fact that the left is constantly belittling our men and women in blue. It’s not about “common sense” with these people. It’s about control. And Republicans, like Senator Chuck Grassley, trying to schedule a hearing in his committee is downright treasonous in our books! Who has Senator Grassley’s ear? Gun owners or gun grabbing Senator Diane Feinstein? And is this proposal something Idaho’s two Senators intend to support? Or will they stand strong against this gun grabbing scheme? After dealing with President Obama for the last 8 years, and defeating every gun control push he made, how sad is it that with Republicans in charge, there is a chance of gun control? You can’t let this current push go unchallenged! That’s why we need your immediate help! First, we need you to contact Senator Chuck Grassley who heads up the Judiciary Committee that intends to hear the bill and tell him to delay it, permanently. Second, we then need you to contact both of Idaho’s Senators and tell them to oppose the bill and any like it. Finally, be sure to follow us on Facebook! We get out emails as quickly as we can, but Facebook is often a quicker way to get important alerts while emails are being drafted. No matter what you do today, we need you to contact Senator Grassley and Idaho’s two Senators right away and demand that no gun control be given a hearing. The time to act is right now! P.S. In wake of the Texas shooting, America has found itself in the gun control debate once again. And while gun grabbers are waging a war in the media on our 2nd Amendment rights, some Republicans have been quietly scheduling a hearing for a “bump stock” ban. 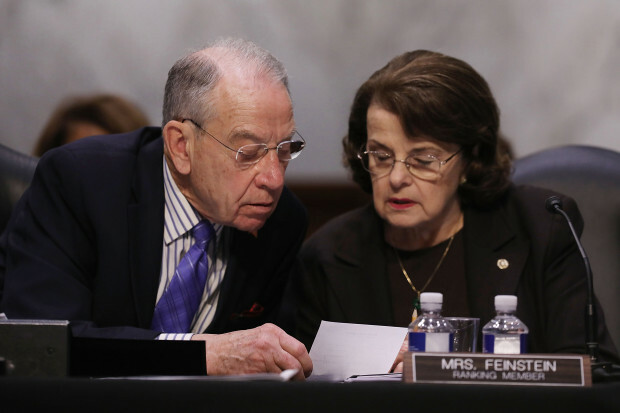 Senator Chuck Grassley’s committee (Judiciary) is hoping you won’t see his behind the scenes move to pass gun control. Chuck Grassley is a Republican from Iowa and is willing to bring gun control to his committee. It’s up to you to stop him! His contact information is above. Once you have contacted him, please contact both Idaho Senators right away and tell them to oppose any new gun control! Their information can also be found above. The Scary Part About Today?